During presentations this week at the annual fall meeting of the American Geophysical Union, researchers at the University of California, Irvine, announced that the region’s most visible signs of drought – shrinking reservoirs – are dwarfed by groundwater losses. The Mojave Desert is a sandy backdrop to the irrigated fields along the Colorado River in Arizona. Water storage in the iconic basin has declined since 2005, chiefly because a long-term drought has prompted farmers to pump more groundwater. Click image to enlarge. As a first-ever declaration of water shortage in the Colorado River Basin approaches, water managers are paying keen attention to shrinking supplies in two bellwether reservoirs – Mead and Powell – which are both less than half full. But ongoing research from the University of California, Irvine, suggests that the bigger problem lies underfoot. Surface water losses from the reservoirs are just a small part of the Basin’s overall water loss since 2005, said Jay Famiglietti, professor and director of UCI’s Center for Hydrologic Modeling. Stephanie Castle, a graduate student who works with Famiglietti, presented UCI’s most recent findings on Wednesday, December 11, in San Francisco at the annual fall meeting of the American Geophysical Union, the world’s largest Earth sciences conference. Like earlier studies of California’s Central Valley and the Tigris-Euphrates Basin in the Middle East, the UCI research team assessed fluctuations in water storage using data from NASA’s GRACE mission, a pair of satellites that translate changes in gravity into changes in water volume. From March 2005 to June 2013, the Colorado River Basin lost 5.7 cubic kilometers (4.6 million acre-feet) of water per year, or more than 47 cubic kilometers (38 million acre-feet) over the 100-month study period. The cumulative losses are equal to 1.3 times the storage capacity of Lake Mead, the nation’s largest reservoir. Most of the water losses are attributed to groundwater pumping, mainly for irrigated agriculture. Deviations from the average of total water storage for the Colorado River Basin via the NASA GRACE mission for March 2005 – June 2013 are shown below. For more information, please contact Jay Famiglietti, @JayFamiglietti, professor and director of the Center for Hydrologic Modeling at UC Irvine. Click image to enlarge. During the 2005-2013 drought period, the Basin lost 5.7 cubic kilometers (4.6 million acre-feet) of water per year, or more than 47 cubic kilometers (38 million acre-feet) over the 100-month study period. Much of this is attributed to excessive groundwater pumping, and much of this was used for irrigated agriculture. Presented at the American Geophysical Union Fall Meeting 2013, S. Castle et al., H31N-04. 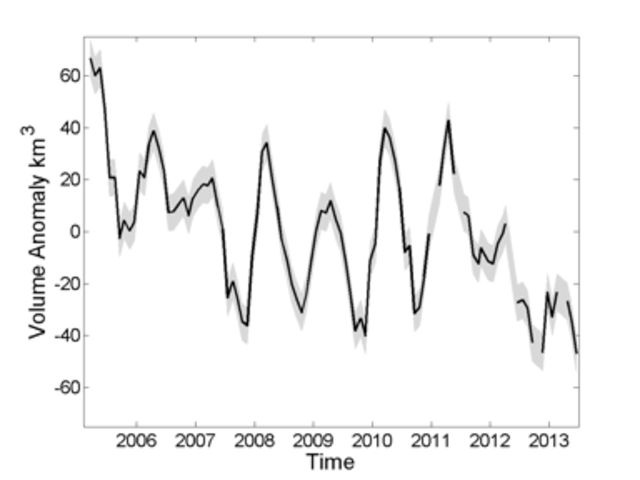 Quantifying Changes in Accessible Water in the Colorado River Basin, and Castle et al., 2014, paper in preparation. The GRACE satellites measure total water storage – the water in mountain snowpack, reservoirs and rivers, soils, and aquifers. By subtracting the known quantities from other data sets, the value for each component can be reckoned. The research team is still analyzing those data, but preliminary results strongly suggest that groundwater is the prime culprit for the losses. 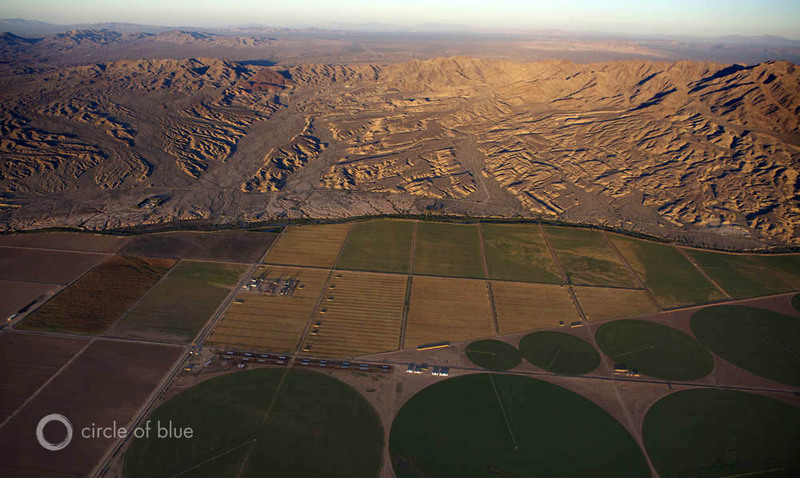 Castle told Circle of Blue that she compared the GRACE data to groundwater monitoring wells that are operated by state and federal agencies in the Upper and Lower Colorado River Basins. The water levels in the monitoring wells were consistent with what the satellites were detecting. Though Castle acknowledged that water agencies in Arizona and Nevada – which, along with California, make up the three Lower Basin states – are storing water underground in a process called “water banking,” those savings accounts are relatively small when compared with the broader picture of water use in the region. A sustained dry period, dating to 2000, has left the Lower Basin in a precarious position. In August, the U.S. Bureau of Reclamation announced that next year it will cut the amount of water that is released from Lake Powell — this will be the first time this has happened under an operating agreement that was signed in 2007. If the federal government’s river-flow forecast holds true, the lower release from Powell will set up the Lower Basin for a shortage that could be declared as early as 2015 or 2016. Such a declaration is based on how much water is in Lake Mead. Arizona and Nevada would be the only states to endure water restrictions at this first shortage tier. Moreover, water managers in Arizona told Circle of Blue in August that they would weather cuts in water deliveries from the river by pumping more groundwater. Fascinating. Thanks for the article. It is indeed a fascinating investigation and article. I would like to read the technical report to get an idea of the sensitivity (areal and vertical) of the measurements with the Grace data, and the potential error in the observed water levels vs. those obtained from the satellite data.